Following a membership review that removed 80 percent of its brothers, the Dartmouth chapter of Sigma Phi Epsilon fraternity continues to face internal strife. Over the past four months, Dartmouth Sig Ep has seen calls for localization, threats from current undergraduates to depledge and attempts to have current governing alumni removed from their positions. The alumni board of trustees revised their bylaws to remove other alumni’s voting rights. Earlier this week, one alumnus filed a complaint in Grafton County Superior Court alleging that the alumni trustees have violated their fiduciary duties and seeking to stop them from leasing rooms in Sig Ep to third parties. 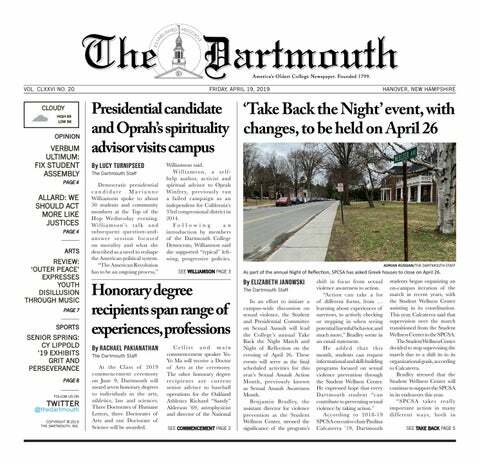 The chapter’s disagreements began this past March, when the national organization voted to conduct a membership review of Dartmouth Sig Ep following concerns about risk management. All 102 members were suspended and invited to complete a questionnaire; provide information about their academic, financial and College conduct records; and undergo an interview with Sig Ep alumni, volunteers and national representatives regarding their fitness for membership. Following these interviews, 19 brothers were invited back as full members of the fraternity. The decision to conduct the membership review sparked outrage among many Dartmouth Sig Ep alumni. Shortly after the review was announced, over 200 alumni signed a letter opposing both the review and a national policy making all Sig Ep chapters dry. After the results of the review came out, a group of 14 alumni sent out another letter on Apr. 26 condemning the results of review, citing both opaque review standards and a decline in chapter diversity. “I run a company … the idea that if I had a problem with the accountability of my employees, that I would try a couple things, and if it didn’t work I would just go fire 80 percent of them, feels like, ‘Whoa, things got real heated there. What happened?’” said Zach Supalla ’07, a former recruitment chair for Sig Ep and a signatory of both letters. This second letter encouraged recipients to join the Alumni and Volunteer Corporation, the alumni’s governing body, giving them voting rights in future decisions. On May 15, a group of 15 alumni — with substantial overlap from the signees of the second letter, including Supalla — called via email for a special meeting of the AVC, scheduled for June 6, to discuss the possibility of going local and to remove two AVC Board of Trustee members, vice president of facilities Herbert Philpott and member-at-large Sean Anthony. The board of trustees manages Sig Ep’s physical plant and mortgage, among other duties. The letter states that Philpott was a key figure in instigating the membership review, while Anthony served on the membership review committee. At the time, this special meeting was valid under the AVC’s bylaws. The AVC board, however, rejected the call for the meeting and voted on May 31 to amend its bylaws, making AVC members non-voting and the board “self-perpetuating.” A statement on the board’s website claims that the change was made “to best fulfill the AVC’s mission of serving the Dartmouth chapter of Sigma Phi Epsilon Fraternity,” and notes that its actions are consistent with a previous bylaw amendment giving the trustees the sole power to approve further bylaw amendments. “The AVC is supposed to represent the alumni, not shut down their voice,” he said. On June 26, the AVC board held a “town hall” to answer the concerns of alumni and undergraduates about the membership review and amendments to the bylaws. On the same day, 14 Sig Ep alumni — again with substantial overlap with the previous letters, and again including Supalla — wrote an email to other alumni summarizing the previous developments and encouraging them to call into the town hall and voice their dissatisfaction. This email called strongly for serious consideration of localization. Also on June 26, the remaining undergraduates at Darmouth Sig Ep wrote a letter to the trustees in which they stated their opposition to the membership review and substance-free policies. In the letter, they called on the trustees to support a path to localization and threatened to depledge otherwise. “Unless the AVC … commits to localization and works with us to address our concerns, the undersigned members of this fraternity are prepared to depledge from the [New Hampshire Alpha chapter of Sig Ep],” the letter states. Dylan Giles ’20, a current Sig Ep and one of the signees of the letter, said he feels that the AVC trustees have unfairly lumped in the behavior of the Class of 2020 with that of previous classes. “The bulk of the incidents that the national fraternity, and also members of the AVC, continuously refer to occurred while we were not even on campus, let alone members of the house,” he said. Giles said that he was in favor of going local, given the attitude of the AVC trustees toward the current brothers. He said that as chaplain of the fraternity, he is responsible for overseeing brotherhood standards and believes he has improved the house’s accountability. Nevertheless, he is not sure at this time whether or not he will feel forced to depledge, hoping instead that the chapter can work out its differences with the board. The newsletter noted that because the undergraduates have threatened to depledge in lieu of localization, it is likely that Sig Ep national will revoke the chapter’s charter and that the house will go dormant. It states that in the future, it plans to recruit a group of “founding fathers” committed to Sig Ep national’s ideals to help rebuild the fraternity. It also states that the trustees are working with the College in the short term to find tenants for the house and keep the organization financially solvent, given the current shortage of housing on campus. In response to a query about possible plans to lease Sig Ep’s rooms to the College, associate dean for student life Eric Ramsey wrote in an email that the College has been contacted by Sig Ep national about the facility and chapter recognition, but that he cannot speculate about what direction Sig Ep national will take. “What I’m surprised by is [that] there doesn’t seem to have been any moment when the AVC looked at itself and said, ‘Huh, there sure seems to be a lot of people who have concerns here. Maybe this wasn’t right,’” Supalla said. In response to the above actions, particularly the refusal to hold a special meeting and the amendments to the AVC’s bylaws, Alex Becker ’10, a signee of all six alumni letters, filed a class-action complaint in Grafton County Superior Court. The complaint is against the AVC and certain members of its board of trustees: AVC president J.D. Optekar, secretary Peter Hasenkamp, Philpott, vice president of relations Mike Chapman, Anthony and member-at-large Michael Kimmel. The complaint is stated to be on behalf of Becker himself, as well as “other similarly situated members” of the AVC. The complaint outlines the events that have taken place over the last few months and alleges that the trustees acted ultra vires — beyond the scope of their duties — in declining to hear the special meetings and removing the voting rights of the current members. It also alleges that the trustees plan to expel all current members from the fraternity in response to their calls for localization and that the trustees are looking to enter into a long-term lease with a third party to fill the rooms at the Sig Ep plant. As a result of the trustees’ actions and alleged future plans, the complaint seeks for the court to declare ultra vires and undo all bylaw amendments since March 1, 2018, as well as issue a temporary restraining order and a preliminary injunction stopping the defendants from entering into any lease agreements for the Sig Ep facility. Becker’s lawyer Carolyn Cole filed the complaint in Grafton County Superior Court on July 24. A hearing is currently set for August 14. Kimmel declined to comment for this article. Anthony, Chapman, Hasenkamp, Optekar and Philpott did not respond to requests for comment.